Our classic gem has been turning heads since she set sail on her first Saga cruise in 2012. Both intimate and elegant, her design has a timeless originality and character, and this attention to detail is matched by ever-attentive service that will make you feel at home as soon as you step aboard. Plus, all her cruises departing in 2018 are now all inclusive, with selected drinks included in the price. Our Royal Suites all have a balcony and en-suite bathroom with bath and shower over. They have either twin beds or a double bed. Owners Suite has a balcony and en-suite bathroom with bath and seperate shower. A king bed or twin beds are available on request. Grand Suites all have en-suite bathroom with bath and shower. Some cabins have twin beds which can be converted into a king-size bed on request. Junior Suites all have a balcony and en-suite bathroom with bath and shower over. Cabins have twin beds or a double bed. 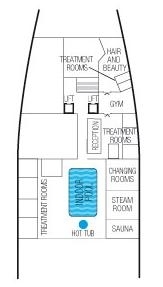 Superior cabins all have a balcony and en-suite bathroom with bath and shower over. Cabins have twin beds or a double bed. One of these cabins is also suitable for those with special needs. These twin-bedded outside cabins all have a window and en-suite bathroom with a shower. These single cabins all have a window and en-suite bathroom with a bath and shower over. These superior twin outside cabins all have a balcony and en-suite bathroom with either a shower or a bath and shower over. Cabins have twin beds or a double bed. These single cabins all have a window and en-suite bathroom with a shower or a bath and shower over. These twin outside cabins all have a window and en-suite bathroom with either a shower or a bath and shower over. Cabins have twin beds or a double bed. These twin outside cabins all have a window and en-suite bathroom with either a shower or a bath and shower over. Cabins have double beds. These outside cabins all have a window and en-suite bathroom with a shower and have twin beds - some cabins can have their twin beds converted into a king-size bed on request. Cabins may have an obstructed or partially obstructed view. These single cabins all have a window and en-suite bathroom with a shower. Cabins may have an obstructed or partially obstructed view. These single cabins all have a porthole and en-suite bathroom with a shower. These twin inside cabins have an en-suite bathroom with a shower. Cabins have twin beds or a double bed. Two of these cabins are also suitable for those with special needs. These twin inside cabins have an en-suite bathroom with a shower and a twin bed. These twin inside cabins have an en-suite bathroom with a shower and twin beds. These single cabins all have an en-suite bathroom with a bath and shower over or shower only. write a review of Saga Sapphire.